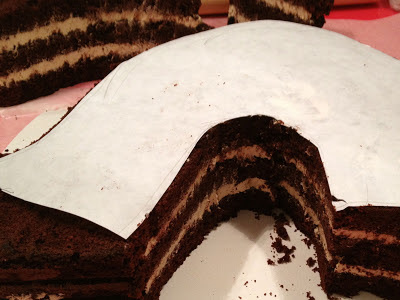 I started this blog about one year ago with my first entry about a cake that I made for my mother's birthday. After a two and a half-month baking and three month blogging break, I am returning with a cake for my mother's birthday (her 60th birthday to be exact, which is a big one!). I have not decorated a cake since August. At that time, we were wrapping up our life chapter in our first home. The baking and blogging break coincided with the transition from our condo to our not-quite-finished-being-renovated house. A delayed permit from the city meant throwing all our belongings in the basement and living with my parents for a short time. This is the first cake that I made in our new kitchen. It has taken me a month to write a blog on this cake due to the ongoing process of getting settled into the house (our basement is still full of boxes), work, singing and school commitments. 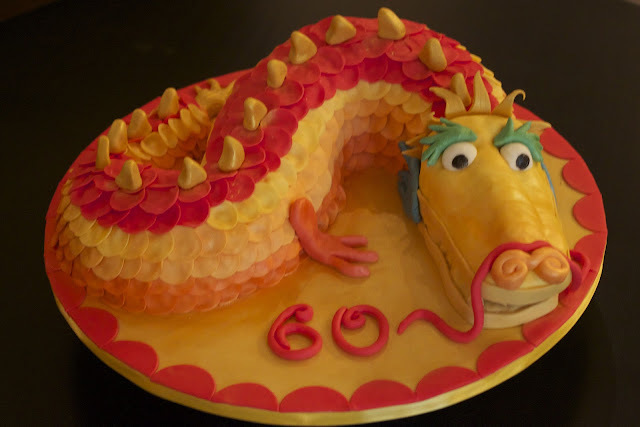 This dragon cake is appropriate in a couple of ways. 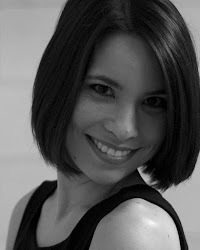 The first and foremost important is that my mom is born in the year of the dragon. The dragon is a symbol of power, strength, luck and prosperity. Interestingly, the dragon also represents change and mobility. This has certainly been a year of change and mobility - literally. We bought a house in May, sold our condo in June, took possession of the house in July and started some major renovations that finished in September. Instead of designing cakes, I was designing rooms in our house. It is a lot of work picking out fixtures, tile, appliances, flooring, doors, etc. I am happy to be somewhat settled in and working on cakes again. 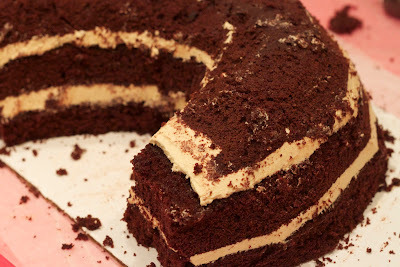 The flavour of this cake was mocha with dulce de leche buttercream as per my mom's request. This is the second cake that I've carved. The first one being Mater for my nephew's birthday last December. When thinking about the best method of getting the dragon shape, my original thought was to use a straight-edge bundt cake pan and arrange the pieces into a snake-like shape. After cutting out a paper template, I did not feel that I could get the width or shape that I wanted. I ended up cutting a piece of freezer paper to the size of the cake board (20" diameter) and freehanded the shape of the dragon. I then took out some baking pans and looked at the best combination of pan shapes/sizes to create the dragon. I ended up using a 9x13" pan for most of the body and a 8-inch round pan for the tail end. It was much easier than baking a half sheet size cake. I still had quite a bit of leftover cake that I used to make cake pops later that week. One of the challenges I had with the carved cake was how to get it on the cake board. Normally, I cover my cakes in fondant before placing it on the fondant-covered cake board. In this case, since the cake was an awkward shape and in 3 pieces it was necessary to cover the cake once it was already on the board. It wasn't too bad. I used my freezer paper template to see where I wanted the cake to be positioned on the board. 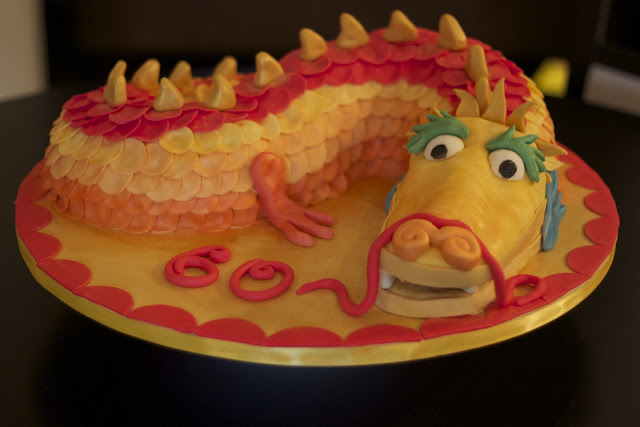 I then used an inscriber tool to lightly mark the outline of the dragon onto the fondant. Each piece had it's own cake board which made it easy to transfer to the large cake board. Once placed on the board, I covered the shape in pieces of fondant rather than one large big piece since any seams would be hidden by scales. I just had to be careful when trimming off the excess. The scales were cut out of modelling paste and then thinned using a ball tool. This took a really, really long time! It is really best to leave the modelling paste wrapped overnight to firm up a bit. It makes thinning the circles easier and neater. I discovered this while making the cake as I was running out of coloured modelling paste. My poor sister was frantically colouring more fondant mixed with tylose and cutting out circles the afternoon of my mother's party. The dragon was dusted with various colours of pearl lustre dust. Teachable moment: when you are severely behind in making a cake, it is very important to stay calm and focused. For this cake, I did not remain calm as I was becoming increasingly late for my mom's birthday dinner. 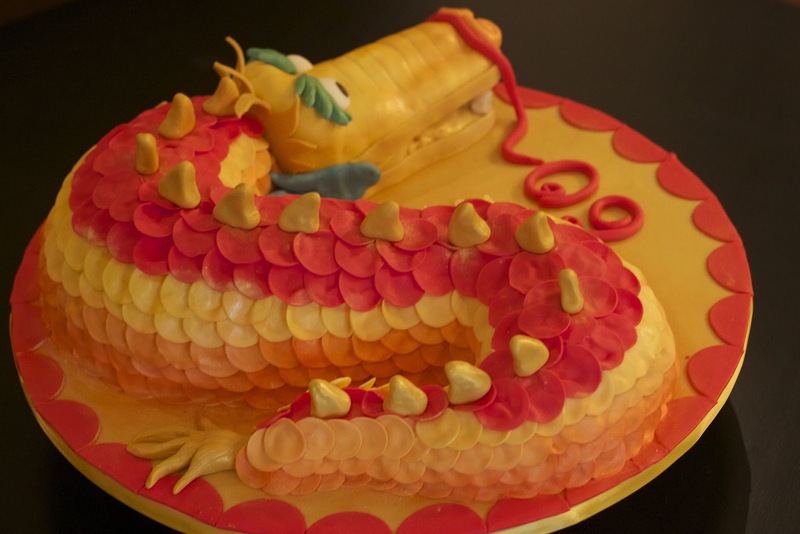 While dusting the dragon, I was gently/or not so gently blowing excess dust off of the cake board. At one point, instead of blowing on the cake board, I blew into the small container of lustre dust. I ended up with an orange face and orange teeth. The head was made from Rice Krispie treats. I had grandiose plans for decorating the face, however I ran out of time, so it was decorated rather quickly and less precisely than what I would have liked. It looks a bit muppet-y to me but the overall dragon look is there. The most important thing is that my mom was surprised and she loved the cake. My baking projects will likely be a little less frequent in the coming year as I try to wrap up my graduate studies but I still hope to be baking and blogging once in a while for fun and stress-relief. Thank you Brandy! I like to use the swiss meringue buttercream recipe in Confetti Cakes with a slight modification in that I use a little less butter and vanilla. 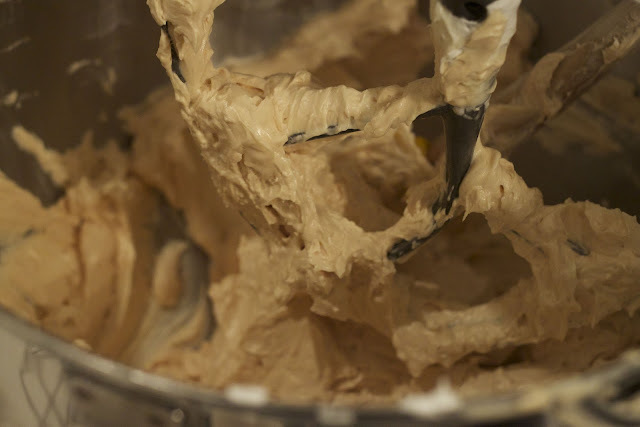 Also, Sweetapolita has a great post on swiss meringue buttercream http://sweetapolita.com/2011/04/swiss-meringue-buttercream-demystified/.